Have any of you planned a sequel for an unpublished book? How common is it to do this? My reason for wanting to do a sequel is that I had some ideas in mind for my protagonist that I think would work better as a second book, rather than trying to cram all the storylines into one book. 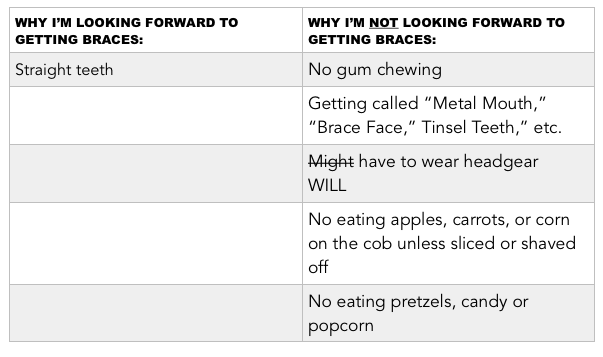 The first book still in progress is all about the protagonist dreading getting braces. For the second one, he is dreading becoming a teenager (more to come on this). Those seem like two separate storylines that could be written and told in two books. 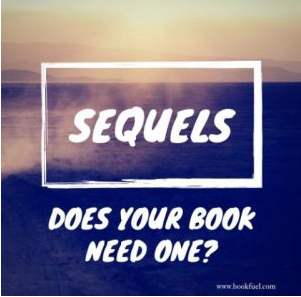 I know that you need to write more than a recap of the first book when beginning a sequel, though I did begin that way and will go from there to lead into the main storyline. It can be pretty tough to write an entire novel without slipping into certain clichés. However, there’s not much that will turn your reader off faster. Clichés tend to interrupt the flow of the story and show an absolute lack of imagination and creativity from the writer. If you are trying to get a publishing deal and your book is full of clichés not only in your writing but also using a clichéd idea, no publisher is going to bite. 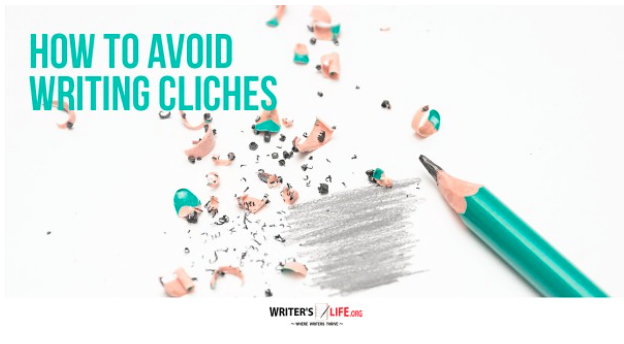 It’s not easy to avoid writing clichés altogether, and often we use them without even noticing we’re doing so. So how can we weed them out, or better still prevent them entirely? Some plots have just been done to death. They have been written and rewritten so many times it’s almost impossible to avoid falling into the trap of a cliché if you choose to focus your story around them. When writing a book, your idea needs to be unique. Make publishers, editors, and most importantly your readers sit up and take notice of something that hasn’t been done before. There is a myriad of moving subjects to choose from when writing a book, and lots of great books have murder, car crashes, bombs going off, wars, descents into madness and so on as part of their plots. However, these sensational subjects can be challenging to write without falling into clichés. This doesn’t mean you can’t tell stories that include these elements. 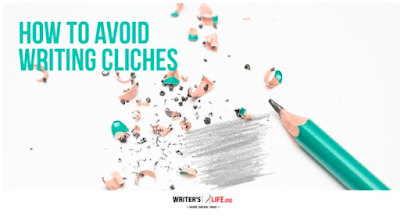 But when you do, pay particular attention to your writing and be alert for any clichés that may appear. One good way of avoiding clichéd writing is by turning everyday events and occurrences into beautiful, unique, unusual, life-changing adventures. 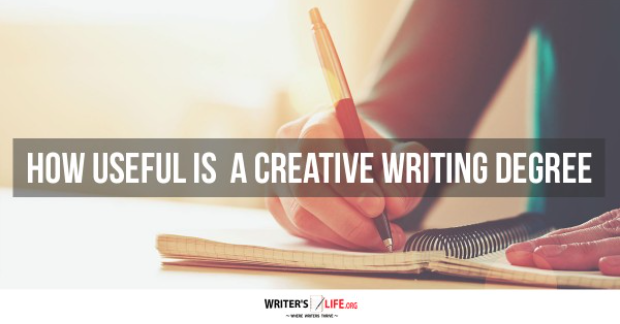 It’s more of a challenge, but by focusing on smaller, more unusual things that happen in everyday life, or taking something that we are all familiar with yet making it suddenly breathtaking or extraordinary is a great skill to have as a writer. Tell your story the way you want to. No one can tell your story or share your experiences the way you do. If you continue to write clichés, it suggests that you are not being honest with yourself. You have a unique perspective and an original voice, tap into that, use it instead of borrowing from others or retelling a story that wasn’t yours to tell in the first place. Clichéd writing often becomes that way because it’s not true to real life. Try to avoid injecting your book with melodrama where it’s not necessary. You’ll only end up creating a story that doesn’t resonate with an audience and lacks the authenticity necessary to connect with your readers. By using the tips above you can eliminate clichés from your writing and create powerfully original stories that really are entirely different than anything else. Just how different can each person get? And just what constitutes stealing other writers' ideas? As some of you may have seen on my blog I felt I was doing just that when I chose to write about depression. But then, that's something different people face differently. That, I learned, is how someone shows their own voice. This is how writers are unique. Some things are bound to be similar in different works, but each one stands out from the author's voice. I'm sure everyone will agree with this. Also, I sometimes ask myself what expressions can be considered cliched. My memoir writing instructor said "the nail in the coffin" is an example of a cliche, which should be avoided in memoirs. I asked once on my blog once if "making big deal out of nothing" sounds cliched (I used that one in the memoir). I try hard enough to make my story sound like my own ideas, even if they have been used before. How Much Should You Cut? So, you can write a 1000 page book? You can. Sure. But, should you? Being wordy gives you a surefire shot at rejection. It is not about showing off your English vocabulary. It is about using only those words that the story needs.. Read your script; see if the book actually requires those 1000 pages of material. In most probability, you would have only 600 pages of the essential story and the rest of unnecessary words hanging here and there! Rationalize. Remember an unedited story is an agony for readers. They are reading till the end of your story just to know what happens in the end. So make each section of your story an acceptable experience for the readers. As a writer, ensure you don’t go the routine way of information over feed. The audience wants to be entertained and not instructed and jaded. Make sure you send out your crispest version to literary agents and publishers. Nobody has the time. This came up at the writing session I attended last Saturday when one of the women conducting the session saw how thick the manuscript of my memoir is. She says something of that length would result in immediate rejection. Though FYI, it is only 321 typed pages. If I was told to type 1000 pages, I'd be panicking! One of the things I dreaded about having to write papers in school was the length dictated and/or the number of words the instructor indicated. Even today, when I can write about whatever I want, the idea of typing 1000 pages seems daunting. It seemed difficult enough to get over 100 pages, let alone 300 or more. Cutting thousands of words from your manuscript seems daunting. Having to cut tens of thousands of words can make you want to curl up in a ball and cry, but it’s much easier than you think. When is a manuscript “too long”? A common “too-long” manuscript is 120,000-words, roughly 480 pages (based on the traditional 250 words per page format). You can cut 4800 words if you delete just ten words per page. Ten words is nothing—it’s one sentence in most cases, and even in polished and published novels you can still find one sentence per page that can go and not lose anything. Cut twenty words per page and that’s almost 10,000 words gone with little effort. A 150,000-word novel? 600 pages, and 6,000 or 12,000 words gone. Cut thirty words—18,000 words down. Working with words-per-page is much more manageable because you can trim consistently across the entire novel, not just certain sections. You might have a fixed number in mind, such as 90,000 words, or a sliding scale, such as 80,000-90,000 words. 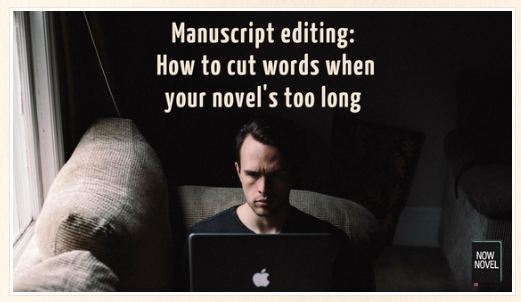 You could also decide to cut in stages, taking out half of the target and then seeing how the manuscript flows before doing anything else. You can trim most manuscripts overall, but some will be heavy in one area and need specific trimming. Looking at the novel’s structure is an easy way to determine where the extra words lie. Act one is the first 25% of the manuscript, the second 25% fills the ramp up to the midpoint in act two. The third 25% is the ramp down in act two from the midpoint, and the final 25% is in act three. So, if your manuscript is 100,000 words, you’d have four chunks of 25,000 words in each. At the end of each act, you’d have a major plot turning point. Remember—these guidelines aren’t exact, but if (using the above example) you discover the first act is 35,000 words, but the rest fits your target word counts, there’s a good chance the beginning is too long. Then you should cut your extra words from there. A 10% variance in section size is fairly normal, but anything beyond that needs a closer look. If you decide an act is working even though it’s longer, that’s okay. The goal is to use structure to diagnose and identify potential trouble areas, not force your manuscript to fit a particular template. Now comes the tough part, but you can do it. Take it step by step, page by page, and be ruthless. If your instincts are telling you what needs to go first, trust them. Do the easy cuts first: Empty words, empty dialogue, unnecessary tags—cut all the words that commonly bloat a novel first. It is often surprising how many “only” “just” and “of the” a novel has. Cut back to front: If you’re cutting words-per-page, start on the last page and work your way back. Not only will this keep you from getting caught up in the story, it won’t adjust the page count and cause you to cut more words from the front than the back as the novel tightens and becomes shorter. Cut one chapter at a time in a new file: It’s a lot easier to hit that goal when you can see those words dripping off. And a bonus: by isolating the chapter, you can look at it more objectively and judge the pacing and flow. Cut one act at a time in a new file: Same principle, just with more pages. This helps ensure you apply cuts evenly throughout your novel. Set time limits on your cutting sessions: The longer you edit, the more likely it is you’ll let something slide because you’re tired and want to move on to the next part. Take a break between editing sessions and avoid this temptation. Now I'm not sure how this would apply to editing a memoir, though I'm sure even those require some editing and cutting as far as the length of the manuscript goes. And right now, I'm trying to decide what to do with the diary novel in terms of the length. Some have said it's long enough for a kids' books. It's currently 100 typed pages. Not a a lot to cut out. What Makes You a Copycat Writer? After the Harry Potter series many writers, all of a sudden, began writing stories with magic as a central premise. After the Twilight series, every other manuscript that landed on a publisher’s desk was about vampires. Don’t fall prey to a seasonal topic. Ensure you are inimitable, distinct and matchless in every sense and you will have a winner in your hands! This was kind of what I had thought at first, that my story would sound too similar to what had already been told. The blogger could have easily written her story. 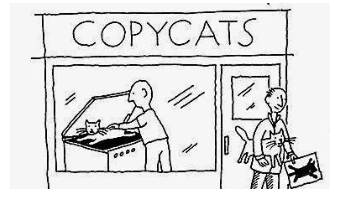 Though I'm not sure how the "copycat" rule applies to a memoir. Now that I have been writing a diary novel, does that necessarily mean I'm copying others that have been published? It wasn't any one such book in particular that made me want to write this, just the format itself. I wanted to try writing that way. Have any of you writers felt this way? You probably depend on these words when you’re unclear of the specific descriptive noun for the situation–a post title such as 4 things successful entrepreneurs do every morning, for example. 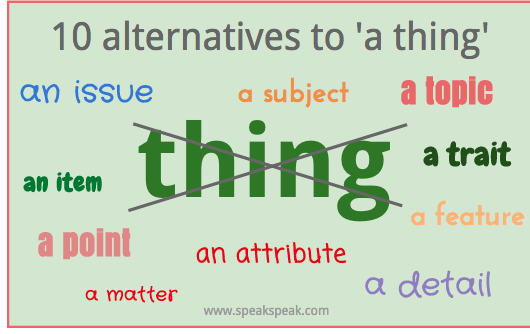 Or, maybe you use ‘stuff’ or ‘things’ when you want to keep your tone informal and conversational. For example – Can you please do this post editing stuff for me? But, if you’re in a business environment, the informality of these words will make you sound unprofessional. 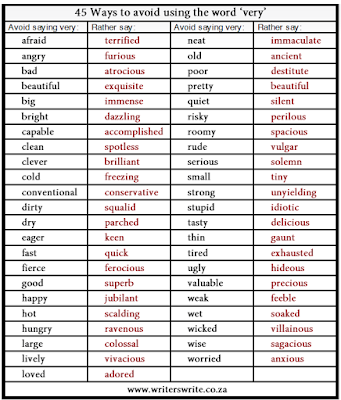 If you use these words excessively in your blog posts, then it’s time to replace them with more accurate and expressive diction. Don’t expect the reader to spend extra energy to extract the exact meaning behind your writing. Content abound on the web and it’s easier for them to just close tabs and find another blog post that holds answers their questions faster and more efficiently. 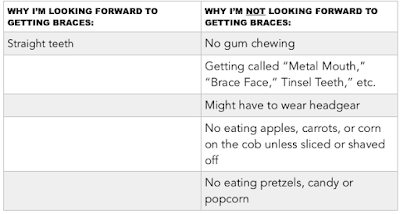 If ‘stuff’ or ‘things’ run rampant in your blog posts, consider using one of these replacements, based on the context. Strategies, reasons, points, concepts, aspects, elements and principles are all solid, more precise words. Here are 10 more alternatives, by Speakspeak.com. The blog from which I obtained some of the info presented in the last two posts also mentions this point. I'm surprised this did not come up at the writing group I attended last Saturday in one capacity or another. Though the blog talks about blog posts, I'm sure the same is true of all writing. Nearly every time when I've edited my memoir I see the words "thing(s)" or "something" quite frequently. I'm now surprised that the woman at the group who'd observed how much passive voice I'd used didn't see how often I had used the words "things," "something," and such. This could easily have prompted such a discussion. It shone from afar, as the tourists were glancing at from behind the mission. It was hard to see what areal appears from where I was standing. The hill glowed very green from what I could see. 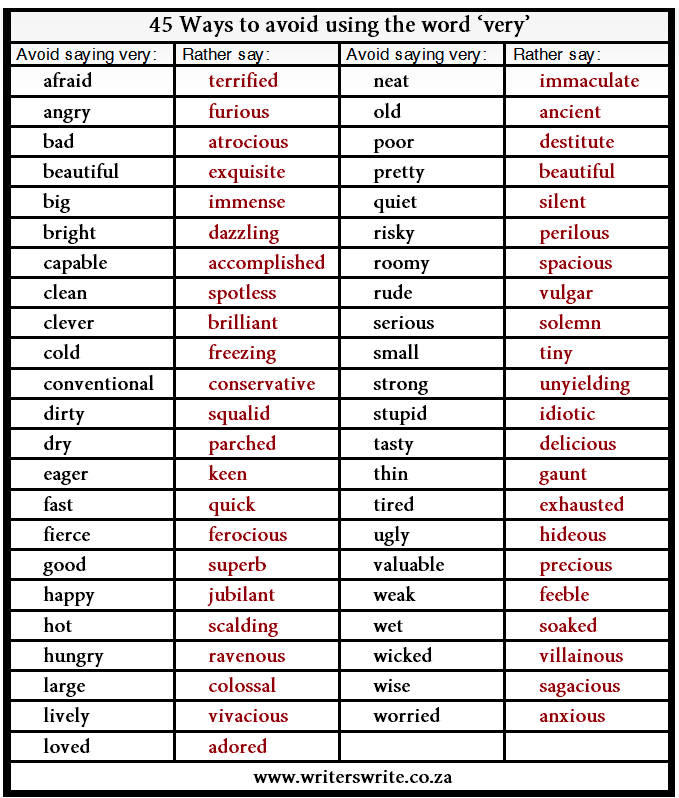 How often do you writers out there find yourself using "very" and how often do you ever use any of the word suggested in the chart above? Some seem a little out of my league of thought. It would not occur to me to use some of these words without reading a blog post such as the one from which I obtained the graphic. I now see myself going over my manuscripts and trying to find how many times I used the word "very." Again, I'm not so sure how many of the suggested words I would dare use. 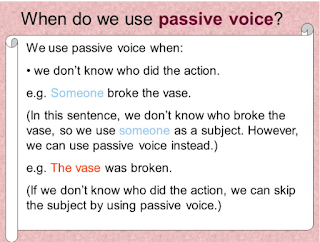 When to Use the Passive Voice? Today I attended a meeting for writing that I had only learned about two days ago. 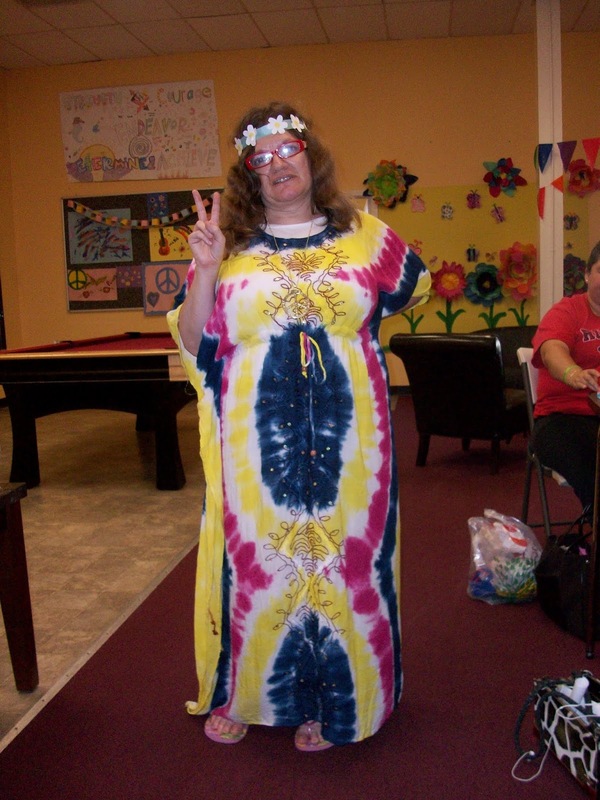 I went with another of the mentors at the center where I work. Not every many people were there. I'd brought the current copy of my memoir and let one of the ladies skim through it. She gave me mostly positive feedback for what she was able to read. But she did say one thing that got me a little anxious--that a lot of my story was in passive voice. My friend said she too has trouble with that. The image above comes from this site. 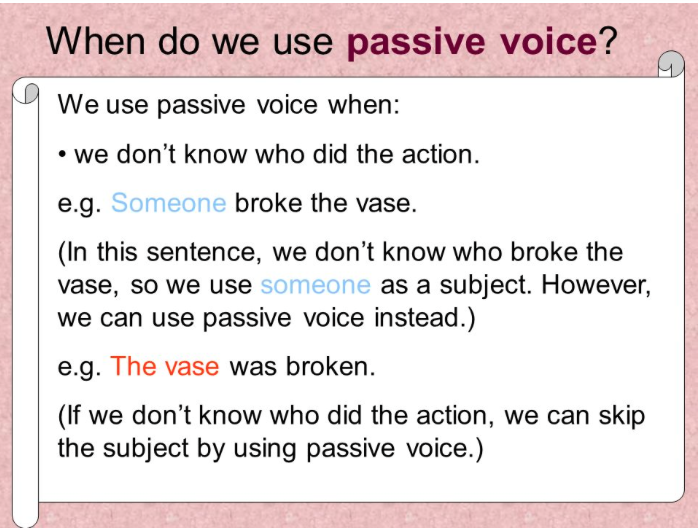 I can imagine how hard it must be for people to avoid the passive voice. And I'm getting anxiety over the possibility of having to go over my entire manuscript and make everything active. There have to be some instances in which the passive is all right to use. This is the first time anyone indicated this about my memoir. How many of you have been told this about your writing? Everyone has days where they don’t feel like writing. But when they days turn into weeks and the weeks turn into months, it can become a big problem. If any of the above sound familiar you might have writing fatigue. But what can you do about it? A change of scenery can work wonders for the imagination. Fresh air and exercise will get that blood pumping - and who knows what you will see or hear when you are out and about that will inspire you with a brilliant idea for your story? Sometimes you suffer from writing fatigue because you do need a break from writing. Let yourself have some time off from it, just don’t let a break turn into a permanent one! Sometimes putting something aside and coming back to it after a few weeks can help us to see new things and spark new ideas that allow us to get over whatever problems we were having when we initially became frustrated. Sometimes need to get back to what inspired us to start writing in the first place. Reading over favourite books or even just finding inspiring quotes can help to lift one's spirits and help us to recollect why we write, what’s important to us and get us back on the right track once more. Take a look at your writing goals. Perhaps you have been pushing yourself too far and have set goals that are impossible to reach. Or maybe your goals aren’t driving you far enough and have allowed you to become lazy. Take a look at the goals and deadlines you’ve set yourself and see if you can change them to keep you more motivated. Get plenty of rest, eat healthily, learn how to relax and unwind and don’t forget to exercise. Keeping the mind and body fuelled with goodness will help you feel energetic positive and focused -all important for being your best writing self. 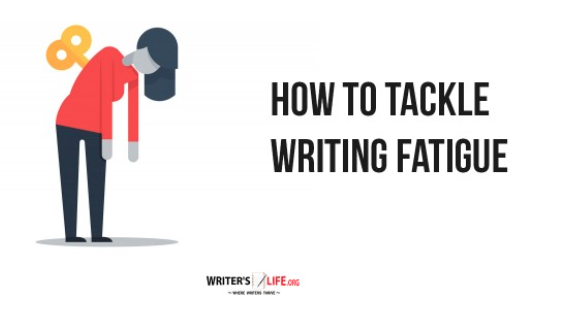 Coming across a roadblock in your writing is frustrating, but there are ways to deal with it. Every writer will experience times where they find it difficult to write, and writing becomes sluggish and even dull to them. The critical thing to remember is to work through this, don’t give up and persevere and eventually, you’ll get back into the flow. Using the tips above will help you get there faster and hopefully make instances of writing fatigue as short-lived and painless as possible! I think I really have writing fatigue right now! I still haven't tried writing anything new, but I have been going over my memoir and continually finding errors. And I'm still not done with that! I do have some ideas for another possible diary novel that picks up where the first one leaves off, but haven't gotten around to writing them down yet. But at least I have something in mind. As far as some of the ideas above go, I think I've been taking too long a break and really need to get back into the mode. But as always, I have been reading, whether or not I consider what I am currently reading to be inspiring. As long as I am reading something. I try to get out of the house, though mostly to go to other places. I'm not really an outdoor person. And getting out is a bit hard right now because the summer weather is so hot right now. But I try, even if it's only for a while. Now two fellow workers are making plans to write books as well. One is planning to do it old school--on a typewriter. She is waiting for one she ordered to arrive. This got me wondering if I should try this method. I would have to obtain a typewriter somehow. Who knows how much it could be? And it's been years since I've used one of those things. The one girl said it would be easier to view what is written when done on a typewriter. I agreed, in that I have to keep on printing copies from the computer. That uses up ink and paper and those can be expensive. It's also easier to view the printed copy than to view the work on a screen. But on a typewriter you can view your work as you type, with no screen. So as you can see, either method has its advantages and disadvantages, even if typewriters are so old-fashioned, as I can picture some people saying right now:) Would you dare still use one in this day and age? A novella can be a great stepping stone in a writer’s journey towards completing a novel, or it can be a standalone project. Whatever the reason or motivation for writing a novella that a writer may have, what it can do is teach them about how to build characters, introduce themes, and convey a story in more depth than short stories do. 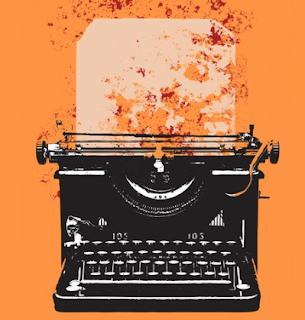 Writing a novella might give you an idea for a novel, or might end up turning into one itself. Like much in writing, the word count for novellas is not set in stone, though 30-60 thousand words is about right. This gives you enough leeway to expand your story if you see fit, or keep it quite concise. Either way, even at the lower end of the word count, writing a novella is no small undertaking. It’s long enough that the reader should become immersed in the world created but short enough that a person might be able to devour the whole story in one sitting. While there are lots of elements of a novella that are also important in a full-length novel, there are also some crucial differences, and it is essential to understand what these are and pay attention to them as you write your story. The beauty of a novella is that you need to pack so much into a limited number of words that there is no room for an excess of anything. The plot needs to be watertight; the story must unfold without deviation. A good structure will provide the base from which to tell the story and needs to be smart and simple. There're likely to be fewer characters, fewer scene changes, and a clear unifying idea that pulls the story together. There should be fewer characters in a novella, and those that do appear should be used economically. Characters need to be impactful, and their presence must be felt right away. All characters should play an essential role in the story, should drive the action and plot forwards and be cleverly executed, so your readers feel as though they know them without having to know everything about them. You don’t have the luxury of pages of backstory, or of letting your readers get to know your characters gradually - they must feel a connection with them almost immediately. While in a full-length novel there are opportunities to bring in several conflicts, dilemmas, themes and subplots, because of the limited word count of a novella, there should only be one. Single time frame, single place, single idea - this way you can fully execute your story with as much power, and attention to detail as if writing a full novel rather than giving a watered down version where the story feels weak as it isn’t fully explained. When it comes to writing a novella, it’s important not to over complicate things. Don’t make life difficult for yourself by trying to pack too much in. Instead, keep things simple while still creating a story that is complex enough to come to a satisfying conclusion without any subplots or digressions from the main idea. By following the above tips you can write a novella that is perfectly paced, keeps the reader hooked, allows them to immerse themselves in your story fully and yet remains simple, sweet and satisfying. So if you are thinking of writing a novella follow the above tips to help get you started. This should add to the page count in book form somewhat. 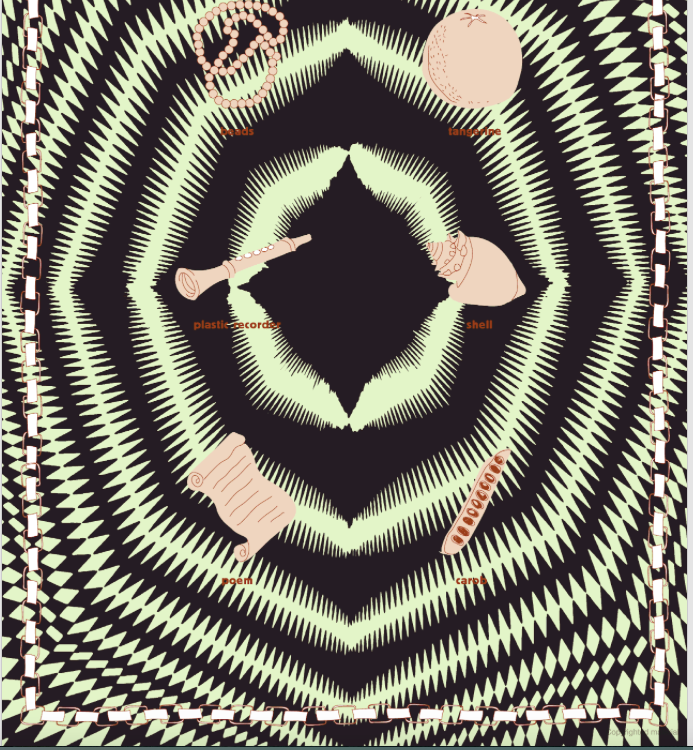 And illustrate some of the story as well. 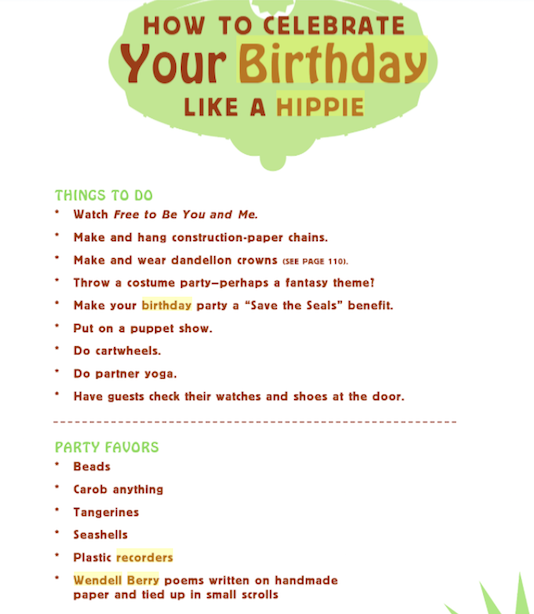 I'm not sure if I followed some of the rules above, but they are only suggestions. I'm speaking specifically about the single theme and content. The theme appears to be about the protagonist getting braces, but several incidents take place over the story, including a school play, kids getting assigned into groups for a class project, and taunts from the mean girls at school. This kind of sounds like the opposite of what is being suggested, but then again, it is only a suggestion. Have any of you who have written novellas ever been told things like these? and did what you have written seem to follow what was suggested? 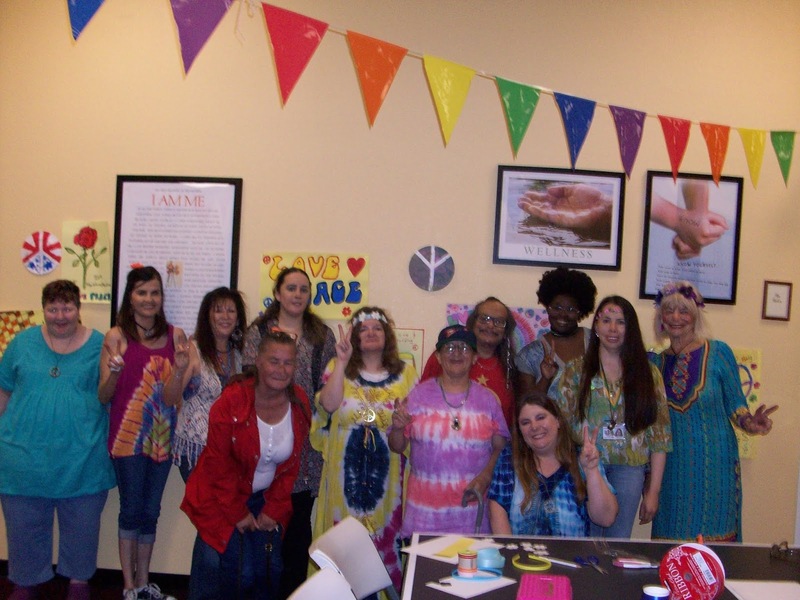 Here are some shots from our party last month at work. My digital camera broke unfortunately and I just learned how to upload photos from the memory card. I'm glad to have found this out. This is something I have been wanting do for years and finally got to do so. I got the idea from this book, which contained a section on "How to Celebrate Your Birthday Like a Hippie." Having a "Save the Seals benefit," doing partner yoga or cartwheels, watching Free to Be Me and You, a puppet show, and checking watches and shoes at the door were not included as activities, but we did have the option to make flower headbands from ribbon and construction paper from the center. I came up this idea on the day of the event because I had wanted to make a flower headband at home, but did not have time to do so. I searched online for poems by Wendell Berry and copied them into my word-processing program, and made them into scrolls, and bought two packs of small plastic recorders from the party section at Dollar Tree. No one was sure where to find carob and our boss was unable to find tangerines. 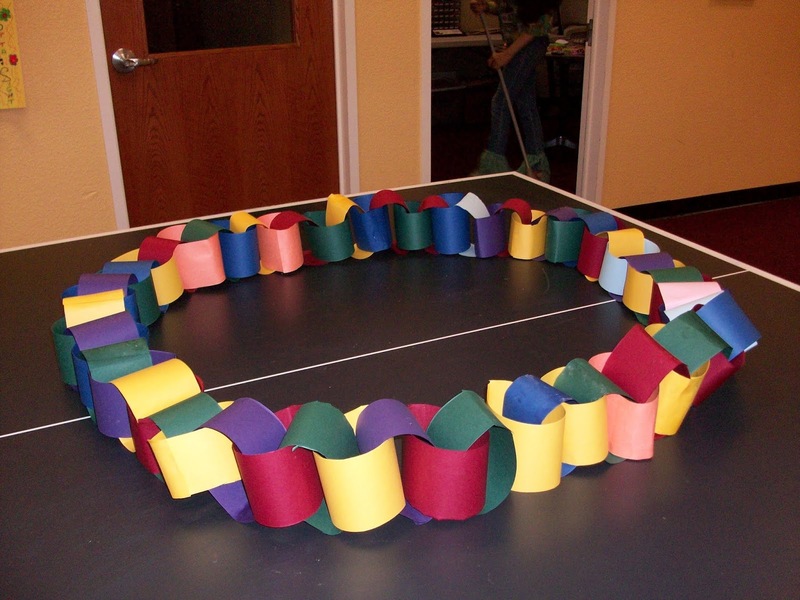 Stringing beads onto ribbon (our boss was unable to find string) was another optional activity. 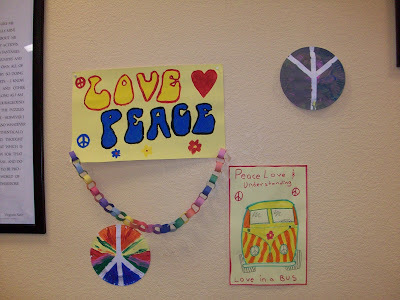 As we prepared for the party in the weeks and months before, we made posters, peace plates and construction-paper chains in art class for decorations. I guess paper chains were a thing then. 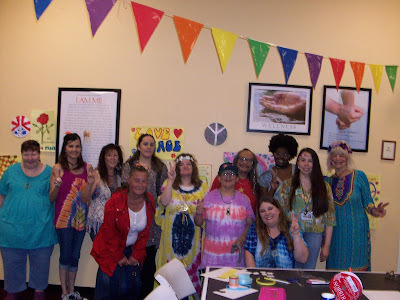 Now the center wants to do another theme party. Some want the 80, some want the 50s and even some wants the 20s. No decisions have been made yet, but a lot of them seem to want the 80s the most. 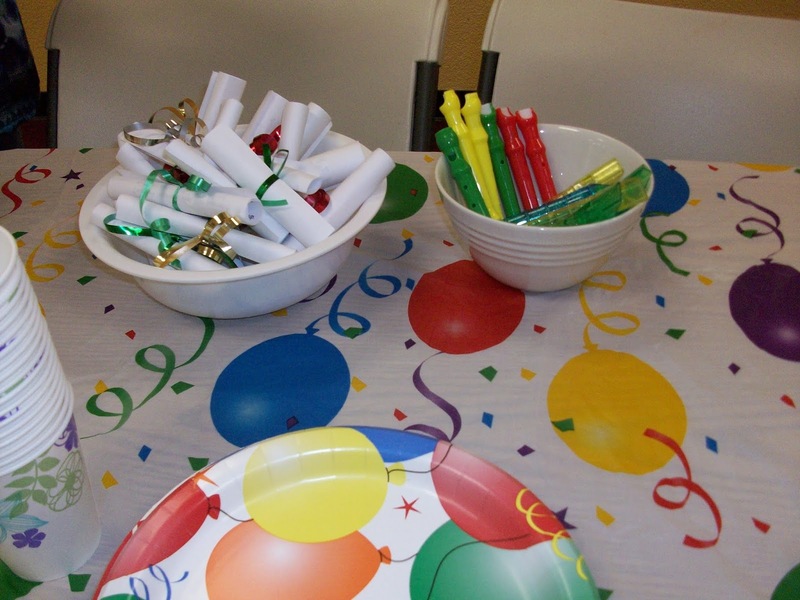 We are hoping to ahem one at the end of August, a month that a lot of our clients have birthdays. The Wendell Berry poems and plastic recorders. we made in art class for party decorations. 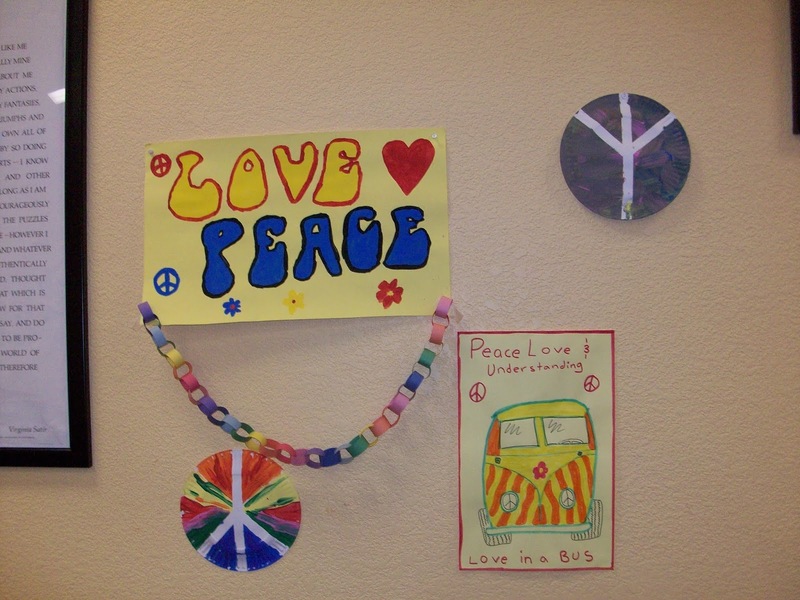 drawing of a hippie bus. 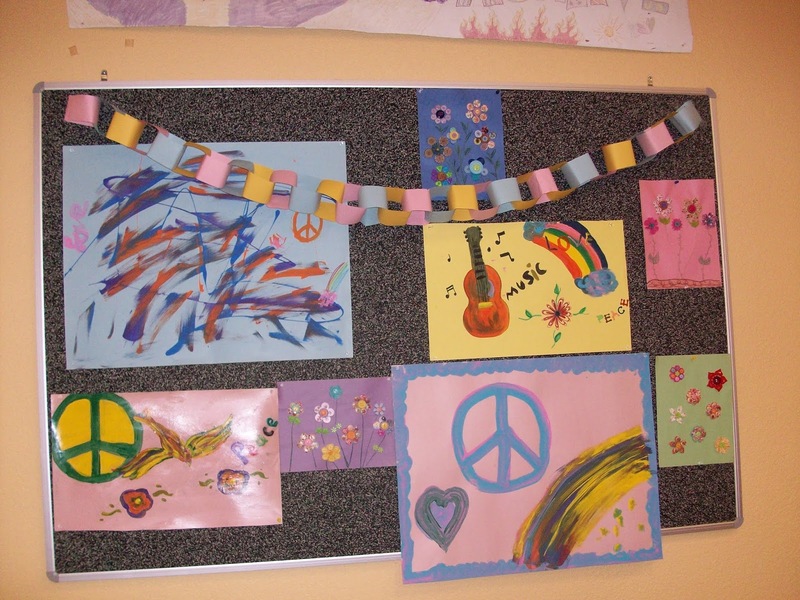 from ribbon and construction paper. 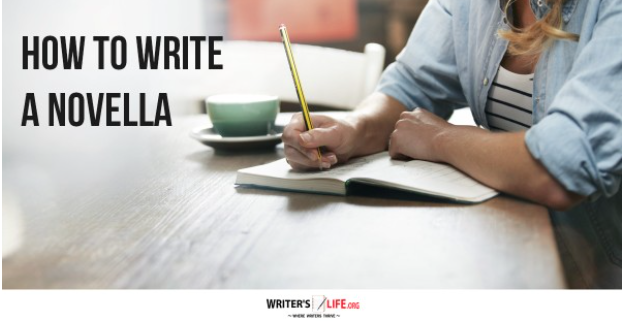 Many writers wonder whether taking a writing course could actually help them not only get better at their craft but also boost their chances of finding a writing-related job. A creative writing degree is the ultimate writing course, a proper qualification in the filed you are so passionate about. But in reality, is doing a creative writing degree a good idea? As with any degree, it’s a massive undertaking and requires dedication to studying the craft of writing, as well as writing essays and creative work which will be marked in order to pass and obtain the degree. Not only that but there is also the question of money. Creative writing degrees can set one back thousands, and without a guarantee of a job at the end, writers have to be pretty sure what they get from the course is worth it. So what can a creative writing degree do for you? 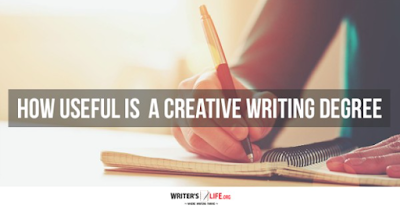 There is no doubt that taking such a course will improve writers writing. Here is an opportunity to study the craft, to learn the different techniques and to be guided by a teacher who really knows their stuff. Of course, taking a creative writing degree will require you to do lots of writing too so just by practicing alone your writing will no doubt get better. A creative writing degree will push you to be more experimental with your writing, to try new techniques and to think both strategically and creatively about the way that you work. It can be difficult for writers to do this without help and guidance and creative writing course is precisely the right environment to give writers the confidence and assistance to push themselves to the max. A creative writing degree will encourage students to become more critical of their writing and more thoughtful and purposeful in the way that they write. Not only will peer to peer feedback be given but creative writing will be assessed as part of the course. That’s like having an editor give you masses of feedback on what’s working and what isn’t - which is a brilliant advantage if you are trying to get published. Of course, there are no guarantees and having a creative writing qualification on your CV doesn’t necessarily mean you’ll get a job in the industry. However, it does look impressive. A degree in creative writing means that students should gain both critical and rhetorical skills which are valued in many creative industries such as education, copywriting, marketing, editing. Being a creative writing graduate doesn’t mean you’ll get published or get a job in the industry, but it does give you an advantage, and if a writer can do one and dedicate themselves to it to ensure they make the most of it, it could help to boost their writing career. I only have a BA in literature, but have wondered if I should consider getting an MA in say, creative writing or some related degree. 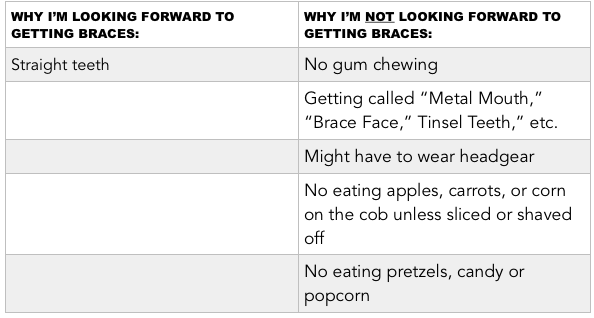 This has not been a big thought or priority of mine, but it has occurred to me on occasion. One such time was when I was beginning to work on my memoir, realizing it was the longest paper I'd ever typed. This made me believe I would not have trouble writing a graduate thesis, given the length of my memoir. But I have had to consider if having a graduate degree is really necessary, as some have said they are only useful for going into careers that require such degrees. This ill need a lot of consideration. Meanwhile, I have joined a critique group on Meetup, one that is near where I live, but which meets on Saturdays at 3PM in a very busy part of town. I have yet to attend and am trying to decide when to do so. A while ago, I been looking over my memoir after being away from it from some time (not sure how long in either case). And as always seems to be the case when looking over anything I have written, I have continued to find typos and omitted words. It's amazing how many times one can look over the same work and still find these things. I have begun noting errors on the current printout. I guess it can be hard to proofread one's own work. I've had to do its may times now, and I wonder how many more times I will have to go over it again, how many mistakes I will miss this time around. So my primary advice on avoiding typos is to have someone else proofread your work. On the other hand, I know this isn't possible for things like e-mail or rushed projects, so here are four proofreading tips I've collected over the years. Read your work backward, starting with the last sentence and working your way in reverse order to the beginning. Supposedly this works better than reading through from the beginning because your brain knows what you meant to write, so you tend to skip over errors when you're reading forwards. Read your work out loud. This forces you to read each word individually and increases the odds that you'll find a typo. This works quite well for me, and most of the typos that make it into my transcripts seem to be things you wouldn't catch by reading aloud, such as misplaced commas. Always proofread a printed version of your work. I don't know why, but if I try to proofread on a computer monitor I always miss more errors than if I print out a copy and go over it on paper. Give yourself some time. If possible, let your work sit for a while before you proofread it. I'm just speculating here, but it seems to me that if you are able to clear your mind and approach the writing from a fresh perspective, then your brain is more able to focus on the actual words, rather than seeing the words you think you wrote. Trying to read something outloud has been hard for me as I read rather fast. And has anyone ever read anything backwards? I would have never considered that one, but I can see it being pretty awkward. And I have been trying tog et others to read my work, but to no avail. What are some ways you look for mistakes in your writing? And how many times has it taken you to get this done?